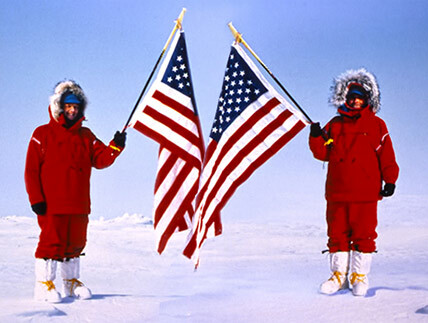 Helen and Bill Thayer are the first married couple to ski to any of the world's Poles when in 1992, when Helen was 54 and Bill was 65, they skied to the Magnetic North Pole un-resupplied and unsupported by snow machines or dog teams. Bill was also the oldest man at that time to have made the journey, pulling his own sled of supplies. In 1996-97 they became the first married couple to walk the entire distance across any of the world's major deserts when they walked 4,000 miles across the Sahara from Morocco to the Nile River using camels to carry their supplies and water. 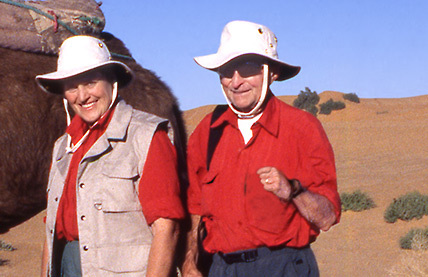 Then in 2001 they were the first couple to walk the entire way across the Gobi desert (1,600 miles) , again using camels to carry supplies and water. Shared adventures require teamwork and understanding beyond normal relationships. For Bill and Helen Thayer, they strengthen their lifelong bond to each other by sharing seemingly impossible challenges. Here in Helen's words are short descriptions of two of the many adventures they have shared. In 1992, Bill and I had been together for thirty years. We were a close-knit team and enjoyed the same activities and adventures. To celebrate our thirtieth anniversary, we decided to ski to the Pole together. I had already skied to the Pole alone in 1988 to begin my work with Adventure Classroom, an educational project for students kindergarten through grade twelve based on my expeditions to remote and challenging areas of the world. Bill had recently retired as a helicopter pilot to join me in my pursuits. He had always been an ardent outdoorsman and enjoyed extreme challenge. His helicopter career spanned almost 13,00 flight hours, much of the flying in Guatemalan rebel held territory, air search, fire fighting, and as an Alaskan bush pilot, so he was no stranger to adventure and challenging situations. We skied the same route to the Pole that I had followed alone in 1988, each pulling our own sleds loaded with supplies. We had no dog teams, snowmobiles or resupply. Although we encountered many of the same problems I had dealt with on my solo journey, traveling with Bill made it a very different experience. We were confronted with polar bears, broken sea ice, 30-foot high pressure ridges that we struggled to pull our heavy sleds up and over. One gale force storm kept us tent-bound for three days while the ice around us shuddered and rearranged itself. Ice conditions change from year to year and 1992 was a particularly rough year all the way to the Pole. Plunging temperatures of minus 50 degrees Fahrenheit or less were a challenge to both bodies and equipment. However no matter what the challenge or problems, we faced them together as a practiced team and instinctively knew what each had to do even in times of extreme emergency. Mid way through the journey we were forced to cross a particularly fragile area of thin ice that was breaking up and threatening to dunk us in the ocean. There was just nowhere to erect our tent. We were forced to find a safer area. As darkness over-took us we pushed on through the eerie gloom with visibility down to a few feet. Unstable ridges of ice blocked our way. In the darkness, it was almost impossible to find a safe path through. The wind increased from a strong blow to a raging storm. At last at 1:30 am, plastered with wind blown snow, we climbed over a twenty-foot high ridge and practically fell down the other side onto a flat area barely large enough to hold our tent. We rushed to erect our shelter before it was too late. The increasing wind threatened to tear the tent from our grasp and send it into the void of howling wind and blowing snow. Without any voice communication Bill threw himself across the tent to hold it down while I raced to screw ice screws into the hard ice. In no time the tent was erect. We dived inside relieved to still have our shelter in one piece. However the incident was an illustration of our teamwork, our ability to encourage each other through grueling situations and our dedication to each other, even under extreme stress. Near the end of the month-long journey we encountered more water leads, areas where the sea ice had split open. One lead, twenty feet across was impossible to cross. The only way around was a half-mile long detour east to where an ice bridge spanned the yawning gap. Bill crossed first – then it was my turn. Wearing my skis, I gingerly started across. All seemed secure until at the last moment the entire bridge gave way. I stumbled, tried to jump onto firm ice and safety, but to no avail. My skis sank into the icy arctic water. Bill reached out and grabbed my jacket and then my arm and hauled me to safety. His quick thinking and actions saved me from an icy dunking and hypothermia. After a month of storms, polar bears, cold windy days pulling our sleds over rough ice and high unpredictable pressure ridges we arrived at the Pole. Although the journey was physically and mentally challenging, we agreed that it was worth every step to have made the journey together. 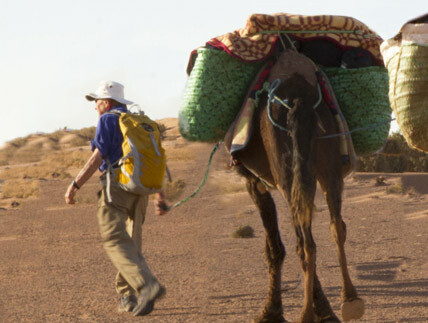 In 1996-97 Bill and I walked 4,000 miles across the Sahara, leading our loaded camels from Morocco to the Nile River. We faced life-threatening situations that would have been impossible to overcome if we had not faced them together. Half way across Algeria we watched an approaching dust cloud, raised by a truck racing along at breakneck speed. Seeing us and obviously surprised, the driver lurched to an abrupt stop. Twelve soldiers dressed in a conglomeration of tattered military uniforms leaped out with guns drawn. The leader demanded to see our identification, visas and our letter of permission to travel across the country. Although our paper work was in order, it didn't satisfy him. In a mixture of English and French he accused us of being western spies and told us that we were under arrest. Inwardly quaking, I struggled to appear calm as I tried to persuade him of our innocence and again showed him our official paper work. Still insisting that we were spies, he shouted orders to his solders to load all of our belongings onto the truck. Reacting to his brazen thievery, Bill confronted the leader. With our GPS in hand, he appeared to type a message to our base camp. Then in an amazingly calm voice he informed the leader that he had just sent a message to our base and they would send a helicopter and crew out immediately. The leader's attitude instantly changed from aggression to obvious alarm. Waving his arms and shouting more orders he instructed the solders to throw everything off the truck. They all clamored aboard, almost falling over each other in their haste and sped away in a cloud of sandy dust. The emergency was over. Of course the GPS wasn't capable of sending messages, there was no base camp, and our expedition budget certainly did not allow for helicopters. Through quick thinking and daring to take a chance Bill had saved us both. We stared at the retreating truck, unable to move for several minutes. Everything had happened so fast it was as if nothing was real. We were aware of the continuing Algerian civil war but we had no idea who these ragged soldiers where allied with, if to anyone at all. Slowly we reloaded the camels and set off weighed down by a deep depression concerning the future of our journey. We had only been in the desert a few weeks and still faced months of dangerous and uncertain travel. We made camp early that night hidden in the midst of a rocky ravine. In the night's darkness we were so afraid that we might be seen that we didn't light our camp stove. All night we hardly slept. All we could think about was that the Nile River was another 3,500 miles away and might as well be on another planet. Then as the first rays of daylight spread across the desert our optimism returned and the task ahead seemed not quite so daunting. Day after long day we walked and slogged through sand dunes, rocky plains so empty and flat they could have rolled off the end of the world. We crossed mountainous ridges, stark and barren. At times we suffered through screaming winds that sandblasted our cringing bodies. Winter winds left us shivering but as the season changed the heat bore down on us as if to deliver us to the gates of hell. There were days when the silence of the desert was overwhelming. Once we even had to walk a hair raising narrow passage through a land mine area. At times we marched like robots, our minds fixed on a distant goal, the Nile River. Much later in Sudan, and only days from the Nile, one dark night with only a sliver of a moon to cast shadows, a group of desert bandits woke us. We stumbled still half asleep out of the tent to confront six men, well armed with guns and long knives. They were already loading their camels with our belongings. They told us that they wouldn't harm us as long as we gave them everything we owned. After a futile effort to convince them to leave us alone, we pleaded that they leave us with our camels, tent ,and eight days worth of water and food. The leader, after a tense few minutes agreed. Soon they had loaded everything except some hay for the camels, five gallons of water, some rice and dates. We were left standing in the dark, badly shaken, but thankful to be alive with a good chance that our now meager supplies would see us to safety. Some days later, we finally stood, tired, and emotionally drained on the banks of the Nile River. We had walked all the way and survived the Sahara! We had endured over seven months of highs and lows, danger and survival in perhaps the most difficult environment on earth. The extremes of this hostile and dangerous desert had pushed us to the very limit of human endurance, but our commitment to each other and our joint commitment to finish the journey strengthened our bond to each other. After many years of expeditions, through all the different dangers and challenges, we have always come away stronger in our relationship. Perhaps it is that we have learned to survive together and appreciate each other's strengths, see each other in environments where there is no pretense, and have learned to accept each other as we really are.